Greenhouse gas emissions contribute immensely to global warming. One of the major constituents of greenhouse gas emissions is carbon dioxide (CO2). It is highly essential to reduce its emissions into the atmosphere. One of the ways to reduce its emissions is to capture and store it. Currently, monoethanolamine (MEA) is used to separate out CO2 from the flue gas. This process is expensive and it comes with a significant energy penalty for the power plants. As an alternative, calcium looping process was proposed. 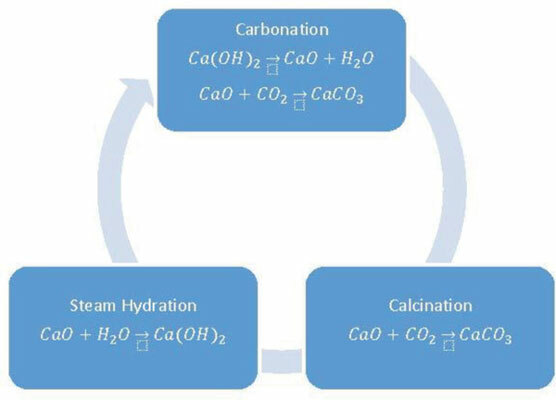 This process makes use of the reversible reaction between calcium oxide (CaO) and CO2 to give calcium carbonate (CaCO3). When separation is desired flue gas is sent through the sorbent (CaO), then it is sent through the regenerator which provides a pure stream of CO2 for carbon capture. This process allows attainment of high carbon capture rates. Furthermore, it comes with a lower energy penalty for power plants. In addition, it can be easily retrofitted to power plants. At present, no known industrial implementations of calcium looping exist. The research thus far is restrained to pilot plant stage. Calcium looping has been proposed recently and a lot of rapid developments are taking place. Bigger pilot-plants are designed for testing newer models developed from the recent experimental findings. Also, newer sorbents are being tested which give an improved performance. In this paper, we will review the current status of research on calcium looping. Our objective is to give a general overview of recent developments in this field. We have addressed its feasibility on industrial scale. We discuss the different models used to describe this process, optimization of different parameters which affect the process, problems associated with it and modifications to this process to make it more efficient and improve it. We also review the economics of calcium looping process in comparison with the conventional process. Furthermore, we have also discussed the potential of wide variety of applications in which calcium looping cycles can be used. Carbon capture, calcium looping, process modelling, energy efficiency, cement plants, MEA.